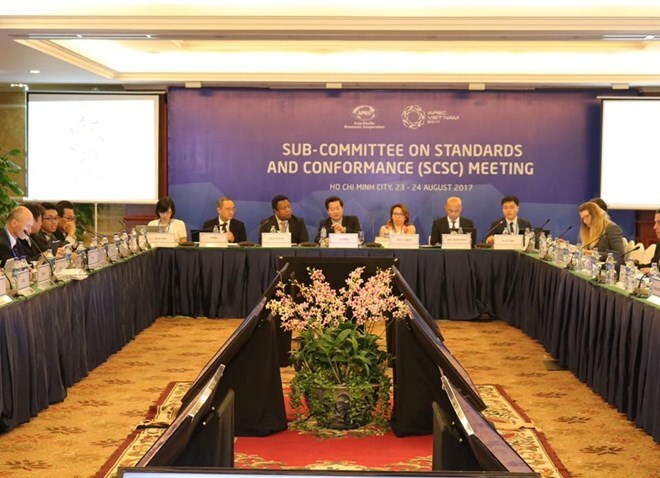 HCM City (VNA) – The second meeting of the APEC Sub-Committee on Standards and Conformance (SCSC) began in Ho Chi Minh City on August 23, focusing on debating trade facilitation, alignment with international standards and active participation in international standardisation. Delegates also discussed good regulatory practices, technical infrastructure development, food and product safety, and standards and conformance education. Malaysia reported the project on “APEC product safety incidents information sharing system,” while the US talked about facilitating trade in information and communications technologies (ICT) projects through encouragement of electronic labeling. Vietnam shared views on best practices sharing of standards and conformity assessment implementation on smart cities of the APEC region. The results of the meeting will be submitted to the APEC Committee on Trade and Investment (CTI).